The main purpose of laser classification is to improve safety during operation. Such categories are often referenced in safety guidelines set forth by regulators, such as OSHA. It is important to point out that these classes may vary, from country to country. This article expounds on laser classes for applications in the US, based on ANSI Z136.1 standard and the Federal Laser Products Performance Standard (FLPPS). The following organizations use this laser classification standard: OSHA, the Centers for Devices and Radiological Health (CDRH) and the Food and Drug Administration (FDA). Class 1 lasers are safe for operation and do not require any protective gear during application. Such units are not capable of emitting beams of optical radiation beyond standard safety thresholds. Because of this, Class 1 beams are not regulated under beam-hazard control guidelines (no warning labels needed). Class 1 laser machines are usually low powered or enclosed to prevent injury. Examples of Class 1 lasers include printers and CD players. Class 2 lasers (400-700nm) are a step above Class 1 that emit less than 1mW. These can either function as continuous wave or pulsed. Natural eye blinking offers protection from this type of laser at a rate of 0.25 seconds. Staring at a Class 2 laser for long periods of time without blinking may result in injury. Like Class 1 lasers, these units are not regulated by specific control measures, but require proper labeling. Examples of this type of laser includes powerful laser pointers and visible continuous wave Helium-Neon lasers. Class 3A lasers are capable of inflicting injury to the eyes when viewed using optical instruments, such as microscopes and binoculars. The beams in this category do not exceed 5mW output and density levels of 2.5 mW/cm2. This type of laser is not harmful to the skin and may not create fires. Proper labeling is required to ensure safety. Examples of Class 3A lasers: firearms and solid state lasers. Class 3B visible, continuous wave lasers emit power ranging between 5-500mW. Periods of short exposure can cause permanent damage to the eye. When viewed under a diffused reflection, the laser is generally safe; while direct exposure and specular reflection are considered to be harmful. In order to view Class 3B lasers, protective eye gear is a must. This type of laser can burn the skin and cause fires. Lasers that emit continuous wave beams above 500mW (for a 0.25s pulsed beam, 10 J/cm2) are classified under Class 4. 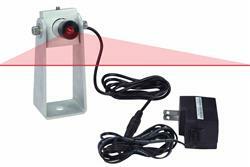 This type of laser is hazardous for all types of viewing methods and mechanisms. It can cause fires, burn the skin and result in permanent eye damage. Scattered beams are also considered to be dangerous under this category. Class 4 laser machines are commonly found in military sites, scientific labs and industrial facilities.